I saved this recipe from Confections of a Foodie Bride’s blog awhile ago and have been dying to try it! My mom came to visit a couple of days ago and she doesn’t really like traditional “breakfast” foods so I thought that she might enjoy these. And enjoy she did! She took a few back with her and my sister reports that they are awesome. I followed this recipe to a “T” and used buttermilk for the entire amount of liquid called for. I did roll the dough into an 8″ circle, however I thought this made the scones mighty large (in comparison to the picture in Foodie Bride’s blog) but everyone loved them and they turned out tasting great! I will definitely be saving this recipe and making it often! **Heavy cream may be substitued for half of the buttermilk. 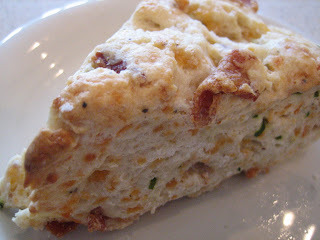 Add green onions, bacon and 3/4 cup of the buttermilk to flour and cheese mixture. Mix by hand just until all ingredients are incorporated. If dough is too dry to hold together, use remaining buttermilk, adding 1 Tbsp at a time, until dough is pliable and can be formed into a ball. 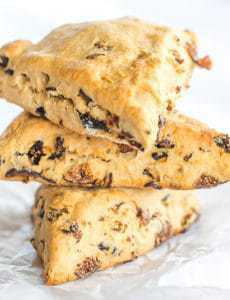 Stir as lightly and as little as possible to ensure a lighter-textured scone. Remove dough from bowl and place it on a lightly flours flat surface. Pat dough into a ball. Using a well-floured rolling pin, flatten dough into a circle about 8 inches wide and 1/2 inch thick. 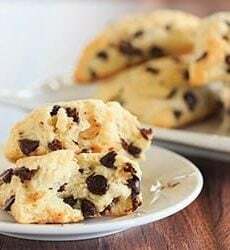 Cut dough into 8 to 10 equal wedges, depending on the size scone you prefer. 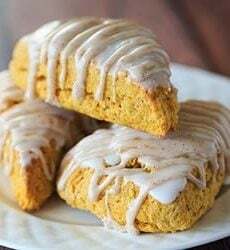 These savory scones are so delicious! What a great idea! My husband ate so many that he skipped lunch altogether:) I’m not a breakfast person at all, but your recipes make it soo much fun! I made these and they tasted great! So tender and delicious! Thanks! I just finished making your Grilled Cheese recipe, It was a great combination, Thank-You. I’ve pinned a number of your dishes. Really like your site. You are so knowledgeable about food science. I am out of heavy cream + buttermilk, but have that refrigerated powder that will add Buttermilk to your recipes. I hope that will be O.K. to use. I baked some scones a few days ago at home with my sisters using some Spanish cheese as it was the only one I had at home, I have to say it was really awesome, it was so smooth and tasty that I couldn´t believe it, I think you should try it too, I´m sure you´ll get mad about it, just have a look at this website and let me know what do you think. These look so great! I think I’ll try them out today.